The story of America’s cavalry is rich in colorful, flamboyant personalities and exciting action. In lively account, Richard Edward Wormser—who was himself an enthusiastic horseman—narrates the story of the U.S. Cavalry’s formative and most fruitful years. Beginning with the American Revolution and the exploits of such men such as Henry “Light-Horse Harry” Lee III, Wormser introduces us to some of the cavalry’s enduring legends: Stephen Kearny, the “Father of the Cavalry,” Jonathan “Stonewall” Jackson, George Armstrong Custer, Theodore Roosevelt, Blackjack Pershing, and many more. 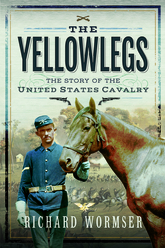 A saga of daring raids, epic rides, and grueling battles, The Yellowlegs charts the rousing story of one of the mainstays of U.S. military history.